HP has distinguished itself from its competitors by launching all-in-one device called the "ENVY X2". 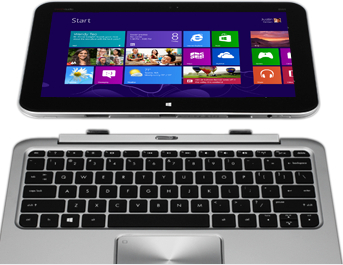 The Envy x2 comes pre-loaded with Windows 8 and apps, including Bing, Finance, SkyDrive, along with shortcuts to eBay, the Kindle store and Netflix. There's also the Fresh Paint drawing app and iHeartRadio. Proprietary programs include the Snapfish photo service, HP Page Lift, HP Printer Control and the HP+ hub. Finally, there's a Getting Started with Windows 8 utility, which could be helpful for those still learning the OS' many gestures. Click on the link below to watch why the device is highly envied. As the name suggests, the device runs a 1.8GHz Intel Atom Z2760 processor, and that should be enough to tell you that Ultrabook-level performance is out of the question. According to engadget review, the x2 scored miles behind Ivy Bridge systems (read: 1,425 compared to ultraportable scores in the 3,000 to 5,000 range). Its I/O performance is similarly lackluster, with write speeds maxing out at 34 MB/s and reads hitting just 83 MB/s.